Kelp is a kind of seaweed. Click on the playlist to see baby polar bears or penguins. Explore a shipwreck surrounded by sharks - if you dare! Click on the video and drag to look around. Click on the play button to see the statue. How fast is a seahorse? Meet amazing ocean animals, from crabs to dolphins. How do polar bears keep clean? Scroll down for lots of facts. There's also a button at the top of the page to watch a video clip about polar bears playing. Make a shark box that bites! Discover the secrets of the sea, from crabs on the seashore to polar bears in the icy north and strange fish lurking at the bottom of the ocean. This fantastic puzzle book will also help children develop skills in reading, counting, matching and identification. 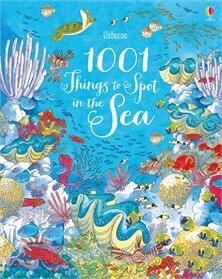 Includes an index, a world map of ocean habitats, amazing facts and internet links to find out more.